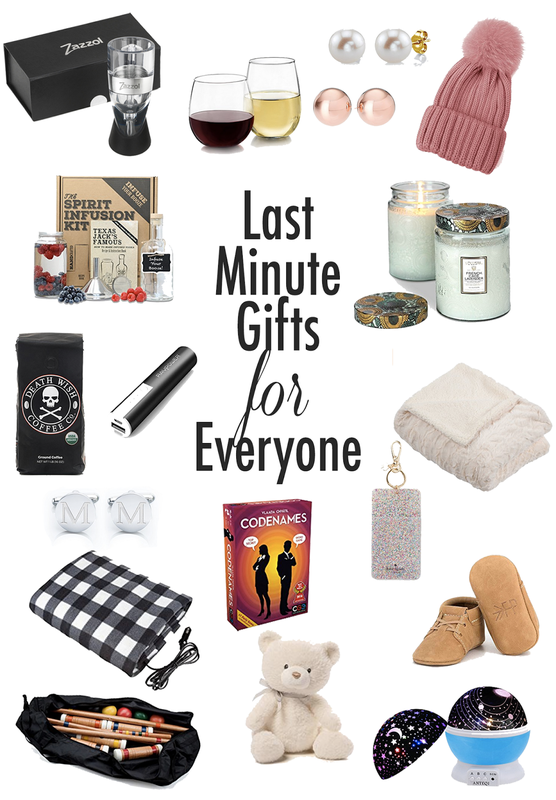 In need of some last minute gifts? Whether you need something for your brother, mother, husband, your sister's new baby, or a hostess gift, I've got you covered! The best part is that everything is that almost every item is under $40 (those Freshly Picked Heirloom Moccasins are an investment, darn it!). All of these items will arrive before Christmas if you order in the next 18 hours with standard Prime shipping! You have until tomorrow to order with overnight Prime shipping, so get on it! CLOCKWISE: 10mm Pearl and 14k Gold Earrings; 12mm Rose Gold Plated Earrings; Pink Pom Pom Beanie; Voluspa French Cade and Lavender 100 Hour Candle; Faux Fur Throw Blanket; Kate Spade ID Clip; Freshly Picked Oxfords; Rotating Cosmos Kids Night Light; Gund Oh So Soft Teddy Bear; Codenames Board Game; Crown Sporting Goods Deluxe Croquet Set; Plaid Electric Heated Car Blanket (I have this and love it! ); White Gold Plated Initial Cuff Links; Death Wish Coffee (a local company! ); Portable Charger; The Spirit Infusion Kit; Zazzol Wine Aerator Decanter; Libbey Stemless Wine Glass Set.